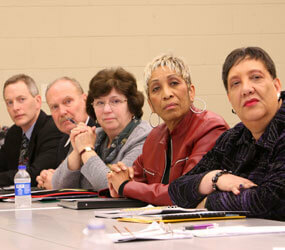 Archbishop Edwin F. O’Brien met with principals from institutions designated elementary receiving schools March 12. The archbishop announced the consolidation of 13 Baltimore City and Baltimore County Catholic schools March 4. More than 2,000 students and 300 employees are expected to be impacted by the closings, which will come at the end of the school year. Students are being encouraged to attend specific local Catholic schools in the fall. It set a collaborative tone for the meeting, which is what the archbishop said the archdiocese will need post-consolidations. The archbishop praised the receiving principals for welcoming new students in various ways. He asked those principals to be “sensitive” to families coming from schools with lower tuition. Archbishop O’Brien joined archdiocesan employees in making phone calls to families from consolidating schools, saying he wanted to help them find another archdiocesan school. Across America, school officials are facing harsh economic realities. Baltimore City announced it will close five public middle schools and Kansas City, Mo. officials announced the closure of 28 schools. Locally, School Sister of Notre Dame Rose Marie Rose Gustatus, principal of St. Thomas Aquinas School in Hampden said her 169-student school is ready for a new era. It has a capacity for 220 pupils and already has a waiting list for pre-kindergarten and kindergarten classes. That is the first time that has happened in 10 years. Sister Marie Rose said parents have told her they just want a permanent education home for their children. “That’s my dream for them too,” she said.